And now, at last, this delicate symphony of suspense has been turned on its ear and retold in the only way it can be: as a musical. A singing chorus of floppy eared lambs narrates the action; Buffallo Bill gleefully dances a hoedown while kidnapping hapless Catherine Martin; and even Dr. Lecter, scary as ever, sings about the life he’d like to lead someday outside the prison walls. A cast of eight skewers the idiosyncratic characters from the movie with ruthless accuracy. Director-choreographer Christopher Gattelli (South Pacific, Sunday in the Park with George) keeps the show zinging gleefully between chills and sidesplitting laughs. Composer brothers Jon & Al Kaplan stop the show over and over again with numbers like “Are You About a Size 14?” “Put the Lotion in the Basket,” and others with hilariously unprintable titles. Fueled by a rabid cult following, SILENCE! shattered every box office record at the 2005 FringeNYC Festival. Alerted to the show’s mad genius by the composers’ website (www.silencethemusical.com), featuring eight of the show’s songs, raucous crowds mobbed the Lortel Theatre, laughing and cheering to the Kaplans’ outrageous songs and book-writer Hunter Bell’s dead-on jokes. Winner of the Fringe’s Outstanding Musical Award, SILENCE! 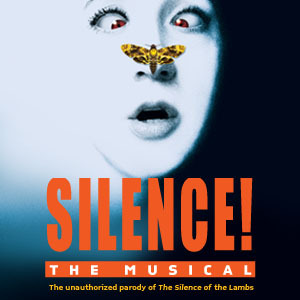 The Musical combines whip-smart dialogue, shocking songs, and over-the-top performances to make a musical parody of THE SILENCE OF THE LAMBS that’s sure to be popular with seasoned fans of the movie and FBI rookies alike.